Experience the magic of Disney from this 4-bedroom, 2-bathroom Orlando vacation rental house. This enchanting property boasts 1,800 square feet of tasteful living space, sleeping accommodations for 8 and a private outdoor oasis with a swimming pool. The property’s prime location is central to all that Orlando has to offer and only 20 minutes from major Disney attractions, guaranteeing a good time for all vacationers! A spacious open layout filled with plush furnishings and updated fixtures marks the home’s interior. High ceilings and hardwood floors run throughout to further the home’s bright and airy atmosphere. Start your vacation off with a full stomach and fuel up for the day ahead in the fully equipped kitchen. Complete with all your basic cooking appliances, the kitchen has everything you’ll need to prepare all your favorites. Serve up your culinary creation at the breakfast bar set for 4, or gather around the glass-top dining table to share a meal with the whole group. Lounge on the sectional sofa in the living area when you’re in need of some down time. A flat-screen Smart TV, soft area rug and sliding glass doors connecting to the backyard finish off the space. 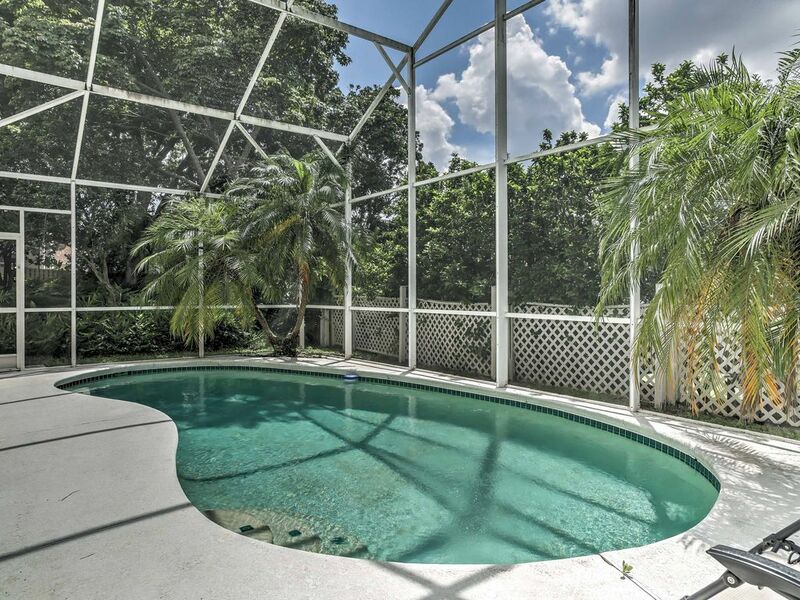 Take full advantage of your “Sunshine State” stay from the screened-in backyard. Relax and recharge in the shaded lounge area or go for a refreshing dip in the swimming pool. Call it a night and break for the bedrooms. The master bedroom boasts a king-sized bed and doors to access the backyard. All 4 bedrooms come equipped with flat-screen TVs and ceiling fans. Offering both privacy and convenience, this property has everything you’re looking for! Nestled in a quiet residential neighborhood, this home is a peaceful retreat away from the hustle and bustle, but still only a short drive away from all that Orlando and its surrounding areas has to offer. Take a day or two to experience all things Disney. Explore the themed amusement parks and treat yourself to a meal at any one of the fine eateries. When you need a break from all the action, head over to Cocoa Beach, located an hour away, for a day of sun, sand and surf. For the golfers amongst your group, numerous world-class courses lie within minutes from the property, including MetroWest Golf Club and Dubsdread Golf Course. Our family of 5 adults stayed for a week. Appreciated plentiful towels, abiltity to do laundry, and comfortable beds. The home is far enough away from the airport, Disney World, and shopping malls that a rental car is a must. (We took a $20 Lyft to and from Universal, which was ideal.) Only suggestions to make house more comfortable would be a second bedside table & lamp in Master Bedroom, a functioning pull out bed in room with couch (hide-a-bed is broken), replacement of vertical window coverings in bedroom and living room (they’re mostly broken or turned, making closing and opening them nearly impossible), and providing larger selection of glassware and mugs. (All of our time at the home was for breakfast or at end of day after a full day of activities and we were constantly washing dishes. ) Other than these suggestions, we were happy with the temperature and cleanliness of the home, the drive to- and surrounding neighborhood is safe and beautiful, and the use of the Automated Lock System was easy for all. Thank you so much for making your home available to us. We had never been to Orlando before, and we will definitely be back!!! Nice house, clean and comfortable. Beautiful house, convenient to shopping and close to main roads. We were in town for a wedding, wanted the immediate family to be together instead of staying in separate hotel rooms. We were close to the wedding venue and got to spend time together. Thank you! John met us & helped me get into the house. He was very helpful & guided us through the layout . It was too cold to use the pool but it looked inviting. We were close to the Holy Land Experience where we spent the next day. There was a nearby shopping center with a grocery store & a cozy restaurant to eat breakfast or lunch. We cooked a couple meals & everything worked fine. We would stay again or tell others of our experience. Thanks.